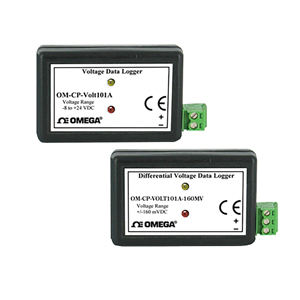 Voltage is one of the most fundamental and useful types of measurement performed today. Many scientific instruments and sensors provide a voltage output that represents the magnitude of some parameter being measured such as temperature, pH, flow rate, pressure, strain, etc. The OM-CP-VOLT101A provides a low cost solution for adding recording capability to an already existing measurement system. Its high accuracy and 16-bit resolution place this product at the forefront for low level DC voltage recording devices. This device is ideal for accurately measuring and recording battery voltages, sensor output signals, photovoltaic studies, as well as many other low level DC voltage sources. With user programmable engineering units, the user can scale the input voltage to most any type of unit desired automatically. This is a unique and very useful feature for presentations. The OM-CP-VOLT101A is available in four different input ranges: 160 mV, 2.5V, 15V and 30V versions. Data retrieval is simple. Plug the device into an available COM port and our easy-to-use software does the rest. The software converts a PC into a real-time strip chart recorder. Data can be printed in graphical and tabular format or exported to a text or Microsoft Excel file. To Start Device: Press and hold the pushbutton and the green LED will flash twice a second. After three seconds, the green will flash rapidly for two seconds; the device has started logging.